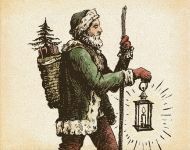 Light up your family’s holiday as costumed interpreters depict Christmas traditions of the 18th and 19th centuries in family-friendly hands-on activities, theatrical scenarios and more. • Site will be closed until 3:00 p.m.
• Brattonsville Road will be closed from 2:30-9:30pm. Follow the detour signs.